MASSACHUSETTS -- There is a new warning for parents about a popular project for kids. Homemade slime is hot "do it yourself" trend right now, but it could also be putting your kids at risk. 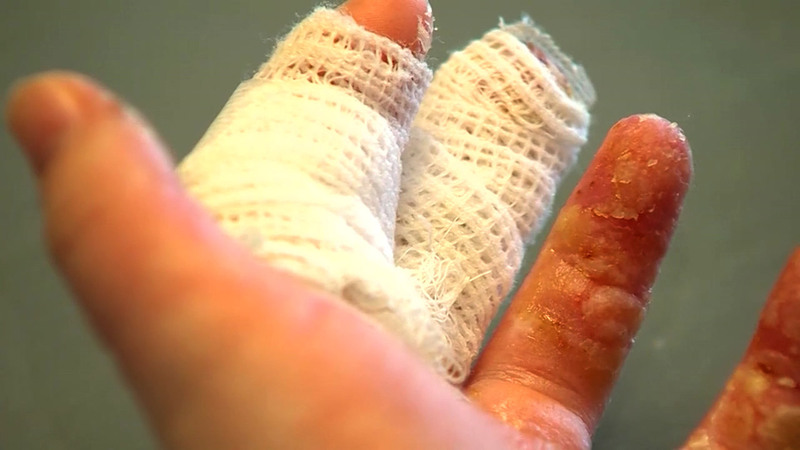 One child in Massachusetts ended up with third-degree burns on her hands, and now, her mother is speaking out about the dangers. For months, Siobhan Quinn thought she was winning the battle between electronics, social media and her 11- year-old daughter Kathleen. "I thought it was great," she said. "I encouraged it, bought all the stuff, and then when they were gone, I bought more. She was being a little scientist...(Now), I feel terrible. I feel like the worst mother." The fifth-grader was making homemade slime, just like seemingly everyone else at school. But last weekend, while at a sleepover, Kathleen woke up in the middle of the night in excruciating pain. "It felt like really hot and tingly," Kathleen said. Mom Siobhan became instantly alarmed when Kathleen returned home the next day. "She was crying in pain, 'my hands hurt, my hands hurt,'" Siobhan said. "When we looked at them, they were covered in blisters." The Quinns took Kathleen to Southshore Hospital, where doctors determined the blisters were actually second- and third-degree burns, likely the result of prolonged exposure to borax one, of the main ingredients in homemade slime. "You just have to really read the packages, know what you're mixing," Dr Megan Hannon said. "Because there are certain things in the home that are just dangerous." It is a difficult lesson mom and daughter had to learn the hard way, but Siobhan hopes her story will resonate with other parents. "I've had other mother say, 'Oh, we've made it a million times, it's fine, nothing happened to my child,'" she said. "We made it a million times, too, and nothing else happened."